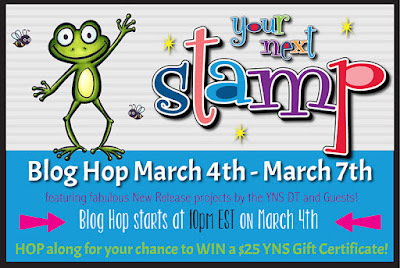 Hollybeary Creations : YNS March Blog Hop!! 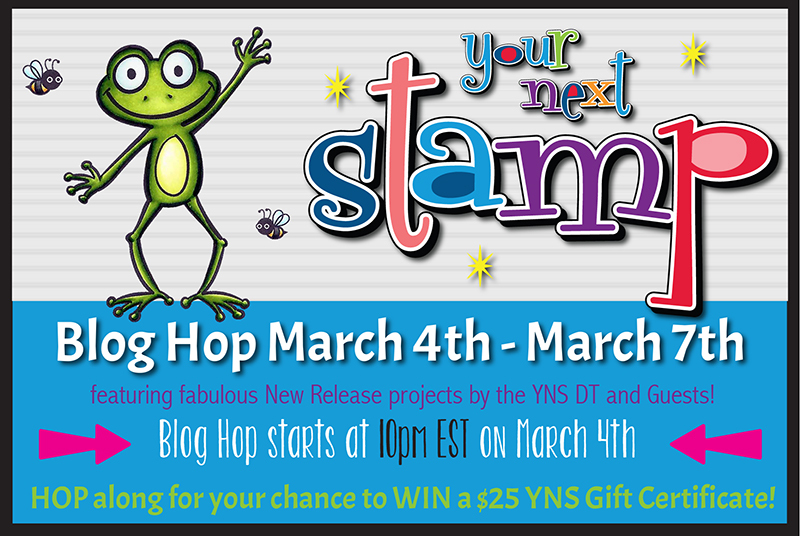 It's time for the Your Next Stamp March Release Blog Hop and full reveal!! You are going to love this release.. It's full of everything you need for Spring! My first project using the fun new Let's Do Take Out set and the coordinating dies. I'm also using some of the new Enchanted Garden Gumdrops.. The colors are Yummy! I created a Distress background on a piece of watercolor paper and then I die cut the panel with the Stitched Rectangle dies and adhered it to a White card base. I stamped the images onto some Watercolor paper and colored them in with Distress Markers. Once they were dry I die cut them out and adhered them to the card with foam tape. I stamped the sentiment from the same set under the images. My second card uses the new All Aboard Spring Carts set and dies and this sets coordinates with last month's release All Aboard. I die cut a piece of Watercolor paper that I added some Distress in too using the new Funky Line Panel die and I adhered the die cut pieces onto a Kraft card base. Then I stamped all the images with the YNS Black Olive Ink onto some Copic friendly paper and colored them in with Copics. I used the coordinating die cuts to trim them out. I adhered the images with some foam tape and stamped the sentiment onto the lower edge. For some extra pop of color I added some of the Enchanted Garden Gumdrops. Head over to the blog for a complete list of the blogs to hop along with or follow below. Don't forget to leave comments along the way for a chance to WIN a GC to the store. All of the products from the release are now available in the store and we have a special for you to stock up!! Such fun cards. The taco is cute but the chick is adorable. Great job. Brilliant cards Holly! I love your watercolor background with the tacos. Love the faces on those tacos! So cute ! Love the die cut background for the second card! Oh great cards, just love the train set!! FANTASTIC CARDS! i'm so in love with your 2nd one!! I love the tacos! My daughters and I are crazy about tacos so we are constantly seeing fun shirts etc. that refer to our passion. LOL. Let's taco about how cute the cards are. the cards are gorgeous!!! What a great release!!! Just darling! The tacos are so adorable. And the chickies, too. I love the new die! OMG I NEED those taco's! Love them both. Super cute. Oh my gosh those tacos!! Too CUTE! Love both of your fabulous cards! oh those are just adorable cards! Oh so cute - and the Gum Drops are such a fun addition. Two delightful cards, Holly. The tacos are so cute and the funky background is the perfect setting for your chicks and egg basket. Thanks for sharing. The tacos are too funny with their smiling faces! Love the new Wonky lines background fpdies. 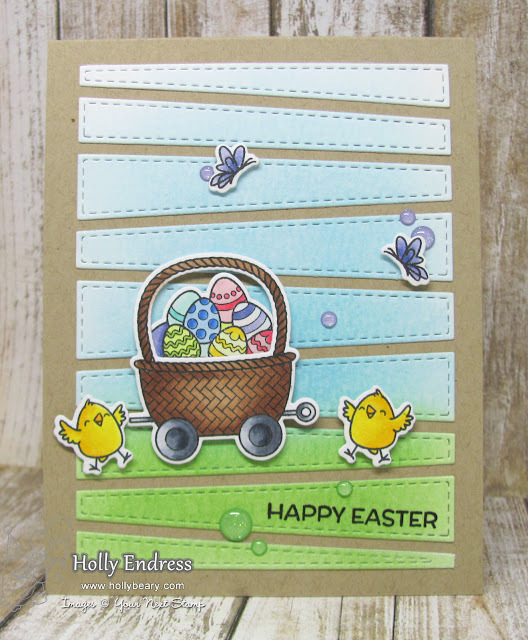 The Funky Line Panel Die is such a great background for you great card. 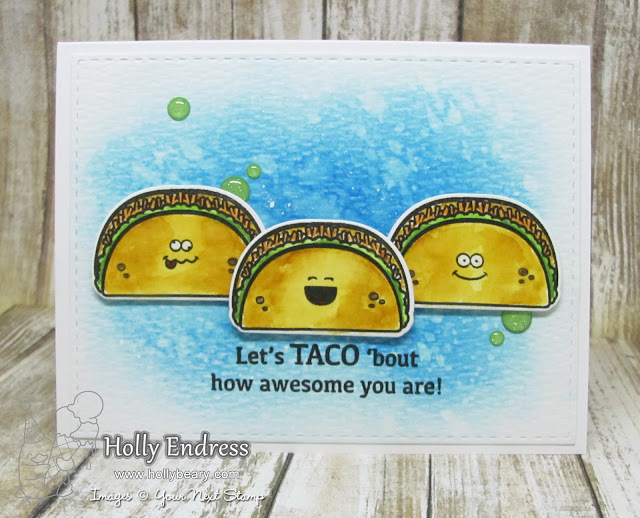 Cute, cute taco card. Love the card with the die. Great design and coloring. 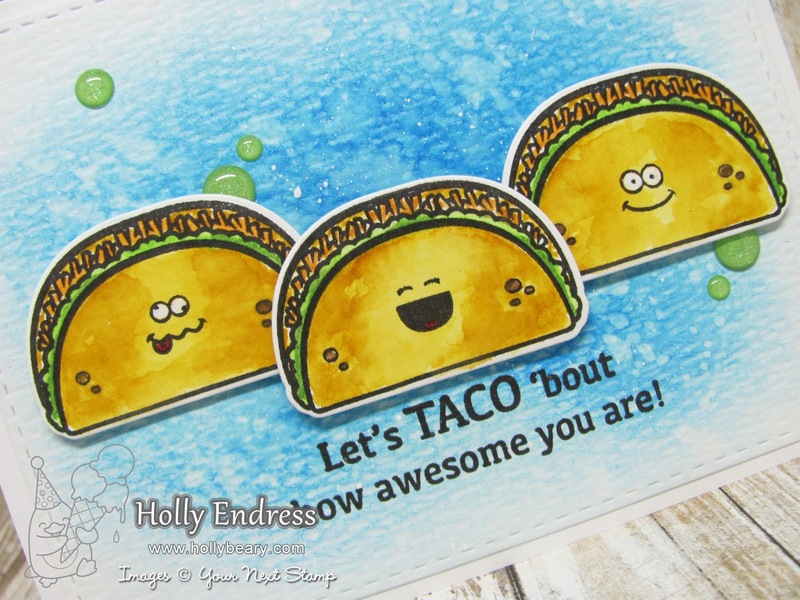 Fun taco card and cute Easter card. I like the background on the Easter card. Cute cards. I really like your Easter card. Both cards are so SUPER cute! !Fun too! Beautiful cards, love the taco one it so made me laugh. Adorable cards! Love the coloring! I cannot wait to get my stitched die! I love how you have used the inside of each section as design element! Both are fabulous but i love the background on the chick card. oh my those tacos are so cute...love your style. Two fabulous cards!! 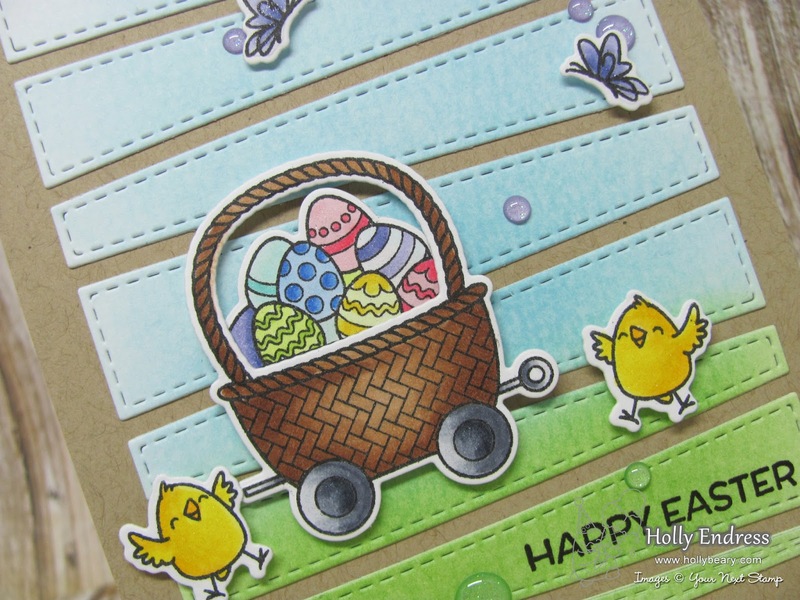 Love the humor of the tacos and springy colors and images of the chuckles with basket!! Love them both!